Dual Momentum Investing details the author’s own momentum investing method that combines U.S. stock, non-U.S. stock, and aggregate bond indices–in a formula proven to dramatically increase profits while lowering risk. Antonacci reveals how momentum investors could have achieved long-run returns nearly twice as high as the stock market over the past 40 years, while avoiding or minimizing bear market losses–and he provides the information and insight investors need to achieve such success going forward. His methodology, supported by rigorous academic research, is designed to pick up on major changes in relative strength and market trend. According to the respected MIT financial economist Andrew Lo (2012), “Buy and hold doesn’t work anymore. The volatility is too significant. Almost any asset can suddenly become much more risky.” Even Warren Buffett’s Berkshire Hathaway, Inc. lost nearly 50% of its market value on two separate occasions since 1998. Mohamed El-Arian, former head of PIMCO, said, “Diversification alone is no longer sufficient to temper risk. You need something more to manage risk well.” Diversification has long been called the only free lunch in investing. Now somebody needs to pay for that lunch. Because financial markets have become progressively more integrated and correlated, multi-asset diversification can no longer protect investors from severe market losses. Such losses can cause investors to react emotionally and convert temporary setbacks into permanent ones by closing out their investments prematurely. What we need now is a new paradigm that dynamically adjusts to market risk and keeps us safe from the vagaries of today’s highly volatile markets. We need a way to earn long-term above market returns, while limiting our downside exposure. 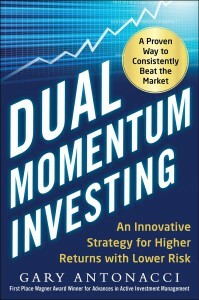 This book shows how momentum investing can make that desirable outcome a reality. Momentum, or persistence in performance, has been one of the most heavily researched finance topics over the past twenty years. Academic research has shown momentum to be a valid strategy from the early 1800’s up to the present, and across nearly all asset classes. After many years of such intense scrutiny, the academic community now accepts momentum as the “premier anomaly” for achieving consistently high risk-adjusted returns . Yet momentum is still largely undiscovered by most mainstream investors. I wrote this book to help bridge the gap between the academic research on momentum, which is extensive, and its real world application, which is minimal. The first goal of this book is to explain momentum principles so readers can easily understand and readily appreciate them. I present the history of momentum investing, and then bring readers up to speed on modern financial theory and the possible reasons why momentum works. I then look at a wide range of asset choices and alternative investment approaches. I finally show how dual momentum – a combination of relative strength and trend following methods that I introduced in two award-winning research papers – is the ideal way to invest. I develop and present an easy-to-understand, straightforward application of dual momentum that I call Global Equity Momentum (GEM). Using only a U.S. stock market index, an all world non-U.S. stock market index, and an aggregate bond index, I show how investors using GEM could have achieved long-run returns nearly twice as high as the world stock market over the past forty years while avoiding severe bear market losses. I am always amazed when I think of how much time and effort most people put into accumulating wealth, and how little study and effort they usually put into finding the best ways of preserving and growing that wealth. Warren Buffett says that risk comes from not knowing what you are doing. This book should help remedy that situation and steer you in the right direction. Dual Momentum Investing is more than just an introduction to momentum investing ideas. It is also a practical guide to help investors and investment professionals tune in with market forces and profit from this newfound knowledge. I have tried to make the book interesting and useful to as many readers as possible. I include some advanced material for those interested in an in-depth treatment of the subject, while also keeping the book understandable to more casual readers. I provide a glossary for those who may need help with the vocabulary of modern finance. So, let us get started.